There's no journey quite as exciting one's honeymoon. Traveling to a scenic destination in the company of your loved one, as you begin a new life together is an eagerly anticipated and memorable time. Maps of World provides information on Honeymoon Destinations Worldwide to help you choose the ideal getaway, for a honeymoon that you'll remember forever. Travel to a secluded tropical island and enjoy a peaceful vacation beside a golden beach or calm lagoon. Enjoy visiting the beautiful cultural venues of Rome, Florence, Venice and Paris when you're on a honeymoon in Europe.Explore exotic cultures and dine on delicious cuisine when you're on a honeymoon in South America. An Asia Honeymoon will take you to some of the world's most ancient civilizations. 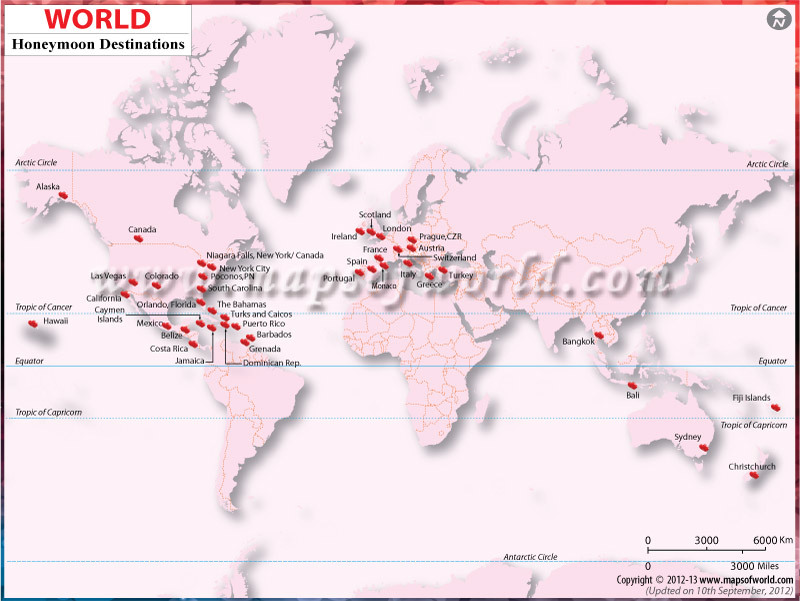 Maps of World offers details about a wide range of fascinating Honeymoon Destinations worldwide. To know more, just click on the links below. Explore a new world as you begin a new journey on the path of your life. Choose your ideal destination from Honeymoon Destinations Worldwide and start another chapter in your life on a honeymoon you'll never want to forget. Maps of World offers information on honeymoon destinations worldwide. Discover the attractions of world honeymoon destinations with Maps of World.